I can't believe we are losing sun, losing heat, and I have officially busted out the jackets and scarves...I do love this time of year, but it's like BRAND NEW INFORMATION when it gets cold...seriously...P.E. tried to tape a "What I wore today" video and we MISSED the sun...and we were freezing...you shall see...and you be the judge. Anyway, I can not say this enough...but you guys are seriously so inspiring and encouraging...I have really been trying to reach out to all of you if not once in a week, and I am still not finding time...but your comments to the most recent videos and outfits have given me so much joy...really...I mean stress is beyond where I am at right now...and while the hubby and I are busy doing all these amazing things...we are just a little burned out...so thank you for giving me some excitement...and for all of you lurkers...I appreciate you too...since I can't visit you or email you to say thank you...just know that I am grateful...oh..and so is P.E....and SISTER...and Thrifters Anonymous Members!!! OMG that scarf/cowl is seriously AMAZING! Sign me up! How can I get one? Lol. Wait...so Tyra had the models in their underwear...in a bowl of salad? HAHAHAHA! This woman has clearly lost her mind. Again. But then again, we ARE talking about it and if it weren't such a crazy idea we probably would have just ignored it. Perhaps the joke is on us? Anyway, enough of Tyrannosaurus. Let's talk about what really matters: Your scarf. It's chunky, brown, and warm, just like my lovely grandma (she's not chunky but I thought it would be funny to say that fyi). Terra Cotta like colors are very in and lucky for you, those hues suit you well. Stunning, fabulous, chic - all rolled up into one outfit. Love it! I'm loving the warm fall colors! 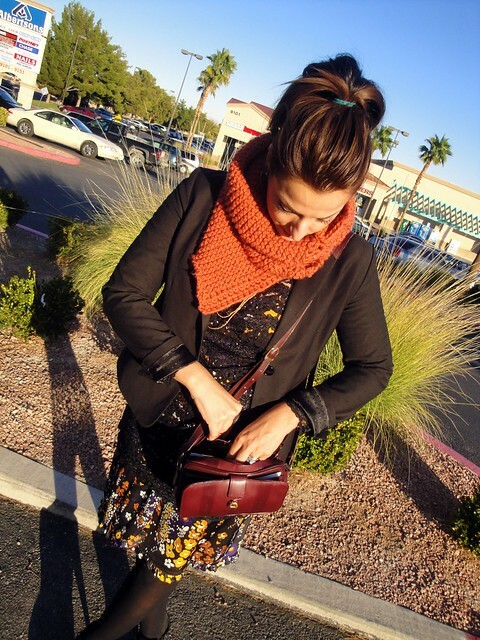 Adore the way you mix patterns- chunky knit cowl, lace, and floral. Jacket and purse just pulls everything together! Great job! Fabulous layering. And that cowl is just wonderful! I love this dress and how creative to put a lace overlay on top (and thrifted at that!) As much as I love layering and wearing boots I just hate the dark nights and cold days! that's a beautiful lacy top, I love the details. And it looks fabulous over the dress. 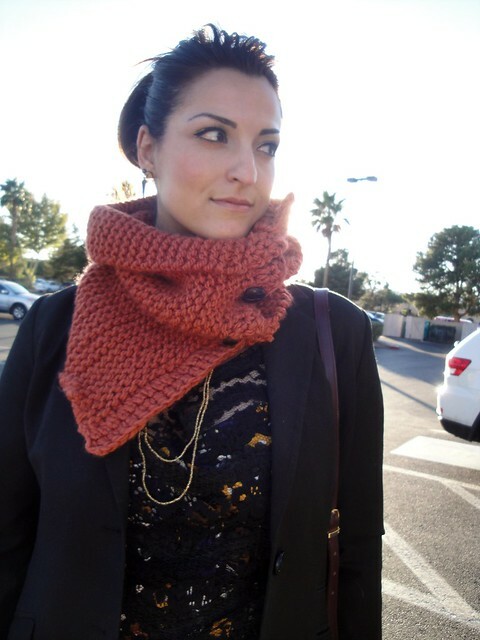 Very clever layering, the scarf is icing on the cake! I would have no idea how to wear that cowl but you make it look great. I'm loving the lace overlay too! Thanks for linking up!